Call 02380 080681 now. No win no fee* solicitors for compensation with supermarket and shop accidents for workers, employees, or customers. Call now for a free phone consultation. Accidents can happen in shops and supermarkets. We offer no win no fee advice. 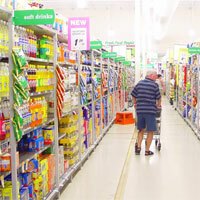 Going shopping shouldn’t be a dangerous activity by any means, but from time to time people will be hurt and injured in supermarkets and shops. In most cases, the injury won’t be their fault, and as such there is the strong possibility of being able to claim for personal injury compensation. We work with people in Southampton and Hampshire who want to make a supermarket accident claim, or look into shop injury compensation. Our lawyers and solicitors have high success rates, and where it’s possible to prove negligence or fault of a third party (typically the store) then we can look at getting you a payout for your pain and suffering. The types of store injury claims we can work on are very varied by their nature, and as such it’s only possible to estimate compensation amounts once we have full details of the accident claim from the client. In simple terms though, if you have been involved in an accident in any of the following locations and the injury was not your fault then you may be able to make a supermarket accident claim for shop injury compensation. For information purposes only we woudl like to mention that UK supermarkets such as Tescos, Morrisons, Waitrose, Aldi, Lidl, Co-Op, Sainsburys, Budgens, Iceland, and Marks & Spencer all have exemplary health and safety records and have high standards for their workers and customers. If you think you are due compensation please call us today and we will quickly be able to tell you whether you can make a shop accident claim in Southampton and Hampshire.